DELIVERY: November 11th - 16th & November 18th - 20th. 7:00am - 5:00pm. SCHEDULE A DELIVERY: If bringing over 500 trees it is helpful if you inform us a few days in advance of how many trees you will have and when you will be delivering them. TREES: Accepted: Fraser, Douglas, Concolor, Canaan, Balsam, Grand, Turkish, Nordmann, & Other Exotic Firs. 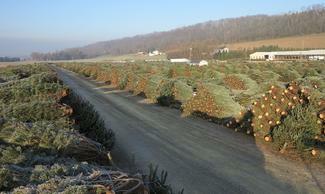 We also accepted limited quantities of other species (Blue Spruce, White Pine, Norway etc..). Trees must be baled. WREATHS & MORE: Items accepted include: Wreaths of all sizes, Roping, Grave Blankets, Candle Boxes, Kissing Balls, Centerpieces, Swags, Grave Blankets, Candy Canes & Crosses, Winter Berries, Bulk Greens, Unique Arrangements, & Much More. Contact us with any questions. FEES: 12.5% commission. Minimum commission is $1.25 per tree. $0.15 cents per tree unloading fee. PAYMENT: Your check will be mailed on December 13th, 2019.